Standing Office Desk: Which Is the Best For You? A standing desk converter (also called a stand up desk converter) is a desk top unit that goes on top of your existing desk to convert it into standing desk. They come in different styles and with different ways of functioning with some being made in metal and plastic and some being made in wood. One of the big advantages of standing desk converters is that they are much cheaper than a full blown standing desk. 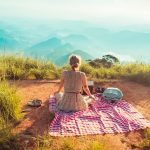 Typically they are priced at anywhere from $150 up to $400. 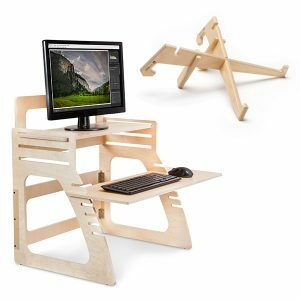 They can be a great way to try out standing while you work without breaking the bank on a full blown electric sit to stand desk which range between $600 up to $3,000. There are a few other advantages with a stand up desk converter such as being more portable and easy to move from desk to desk or to different workplaces if you work from home and the office for example. One of the most important factors not to overlook is the simplicity of a standing desk converter. All you have to do is put it on top of your existing desk which takes only seconds. An electric desk involves installation and fitting and if you work in an office environment then many companies simply may not permit you to install an electric standing desk. 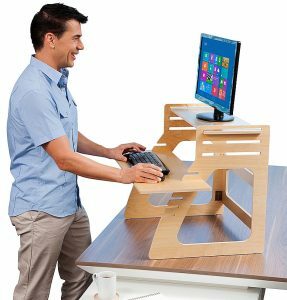 Almost all companies will let you use a standing desk converter and they are paying for it then they will certainly be much happier with the price tag too. 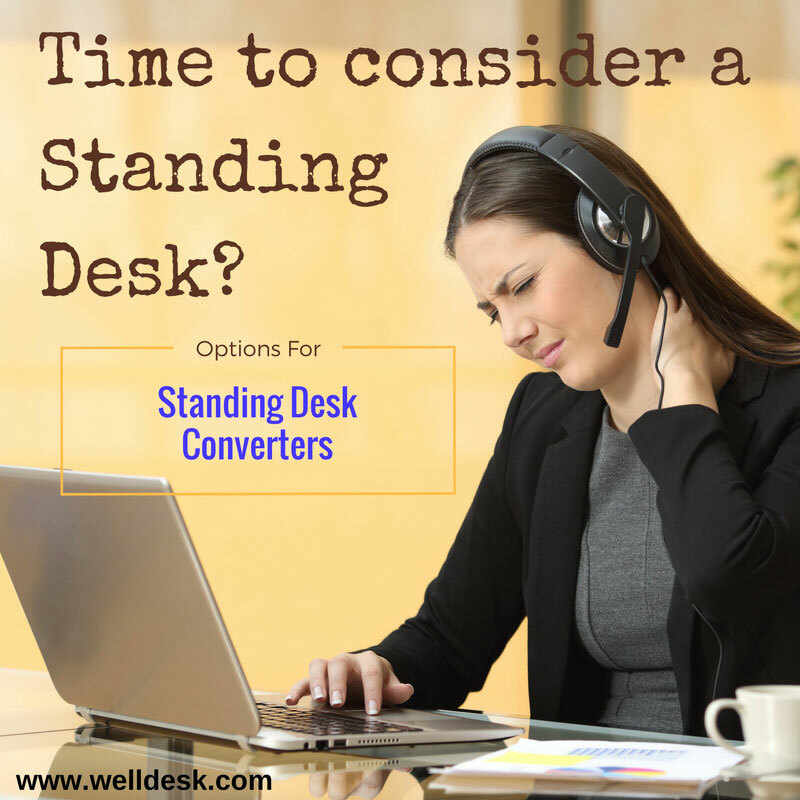 As there are many different types of stand up desk converter let’s have a look at some examples from the main styles. These types of desk converters are sit to stand models. This means that with the use of levers they can be raised and lowered whenever you want to switch between sitting and standing. These types of desks cost anywhere from $350 up to $450 and with some electric sit to stand desks now starting at around $600 I do question whether the price saving is worth it in the long run. Comes ready assembled and you simply need to place it on top of your desk. Cheaper than an electric sit to stand desk. Easy to get permission from employer as does not require any special installation. They are pretty heavy at around 45lbs which makes portability less of an option. They do not really extend high enough. At their highest settings they only place the monitor at around 15” off the desktop height. If you are over 5’6” then you will almost certainly be looking down at your monitor which is not healthy in the long term. Due to the nature of their construction, when in the standing position and you are typing there tends to be a lot of screen shaking and vibration caused by the impact of typing. This can be very irritating. Pushing down on the desk to lower it really requires quite a lot of effort to the spring loaded extension legs. 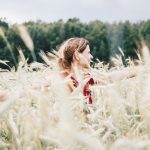 If you already have a bad back then this can become a problem over time. These type of stand up desk converters offer the ability to move the shelves of the unit in order to reach your preferred ergonomic position. Typically they are made of wood and tend to be in the $150 to $200 range. Most are easy to flat pack and can be assembled quickly and easily without tools or glue. They weigh around 15lbs and as they are flat packed are much easier for transportation and offer good flexibility and adaptability. Offer perfect ergonomic positioning with separate height adjustment for the key board and monitor. Cheaper than an electric standing desk or sit to stand converter. Very stable meaning there is no monitor shake or vibration when typing. They do not have true sit to stand functionality. They need to sit at the end of your desk next to your normal sitting area. 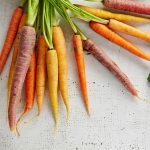 They can be used for sit to stand functionality but this would take some figuring out as to how they could work in your exact working environment and desk space. These desks come with a fixed monitor stand where the monitor needs to be fixed to the stand itself and then the whole keyboard shelf and monitor can be moved as one unit. They have the disadvantage that your monitor can then never be moved off the stand and so they do not offer much flexibility in their use. Most are priced in the $300 to $400 range. Slick looking and modern design. 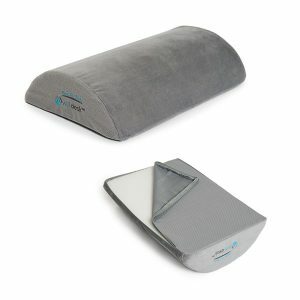 Stable and sturdy unit with minimal screen wobble and vibration when typing. Good sit to stand capability. Monitor is fixed in one place and cannot be moved. Fairly limited keyboard and mouse space when in the standing position. 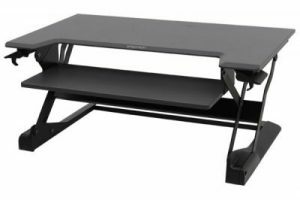 There are other much more simplified versions of a standup desk converter that mostly consist of a small table top mounted on adjustable legs. Whilst these types of units do work they tend to be overpriced for what they are and offer no ergonomic benefits and so we have not reviewed them in any detail. 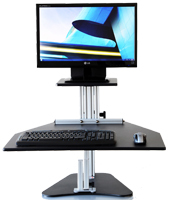 As the need to stand increases I believe that over time standing desk converters will become more popular due to their ease of installation, low cost and most importantly because no special permission is needed to install one in your workplace.